Threatened Bluefin Tuna Sells For $3 Million In Tokyo Market Sushi chain owner Kiyoshi Kimura purchased the 612-pound Pacific bluefin tuna at auction. Conservationists are alarmed about the fate of the species. Kiyoshi Kimura, president of sushi restaurant chain Sushi Zanmai, displays a 612-pound bluefin tuna at one of his restaurants. The company he runs paid a record $3.1 million for the popular but threatened fish. The 612-pound tuna had to be wheeled into its new owner's sushi restaurant on a low platform, its mouth agape. 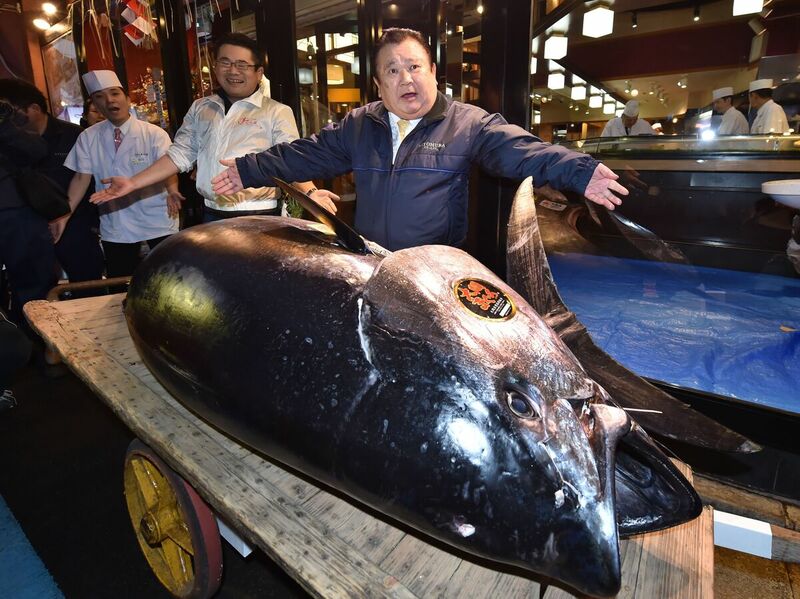 Sushi chain owner Kiyoshi Kimura purchased the immense Pacific bluefin tuna in an auction on Saturday at a Tokyo fish market. The fish sold for a record 333.6 million yen, more than $3 million, The Associated Press reported. The Kiyomura Corp., which Kimura runs, footed the bill at over $5,000 per pound. The fish usually sells for up to $40 per pound, though the price can fluctuate to more than $200 per pound. The gigantic tuna will translate to more than 12,000 pieces of sushi for the company's Sushi Zanmai chain. "The tuna looks so tasty and very fresh, but I think I did (pay) a little too much," Kimura told reporters outside the Tokyo market, according to Reuters. The frequent auction winner has been known to pay well above market price for the immense fish. This purchase more than doubles the last record he set of $1.76 million for a slightly smaller fish in 2013. But many environmental groups would argue the price is still too low for a species that has floated ever closer to extinction. Experts say demand for Pacific bluefin has led to overfishing, causing stocks of the fish to fall to just 2.6 percent of their historic size. "The celebration surrounding the annual Pacific bluefin auction hides how deeply in trouble this species really is," Jamie Gibbon, associate manager for global tuna conservation at The Pew Charitable Trusts, told the AP. Conservation groups blame demand from the sushi and sashimi industry for the rapid decline in population. Japan consumes 80 percent of the world's bluefin tuna. Along with countries including Mexico, Korea and the United States, it has exceeded its fishing quotas in recent years. The International Union for Conservation and Nature has listed the Pacific bluefin tuna as "vulnerable," which means a species is likely to become endangered unless the circumstances threatening its survival change. The Atlantic bluefin tuna, a close relative to the Pacific bluefin, is listed as endangered. Recovery efforts for the Atlantic dweller have shown some success over the past decade, as NPR has reported, but the fish's population is still falling. Another relative, the southern bluefin, is critically endangered. The two groups responsible for managing Pacific bluefin tuna agreed in 2017 to work toward restoring the fish's population to 20 percent of historic levels by 2034. If the Western and Central Pacific Fisheries Commission and the Inter-American Tropical Tuna Commission succeed in their goal, the bluefin tuna population is projected to increase sevenfold from current levels.